Brownies are a form of cake, not classified as a cookie or bar. Brownies are typically eaten by hand, often accompanied by milk, served warm with ice cream (a la mode), topped with whipped cream, or sprinkled with powdered sugar and fudge. In North America they are common lunchbox treats, and also popular in restaurants and coffeehouses. One legend about the creation of brownies is that of Bertha Palmer, a prominent Chicago socialite whose husband owned the Palmer House Hotel. In 1893 Palmer asked a pastry chef for a dessert suitable for ladies attending the Chicago World's Columbian Exposition. She requested a cake-like confection smaller than a piece of cake that could be included in boxed lunches. The result was the Palmer House Brownie with walnuts and an apricot glaze. The modern Palmer House Hotel serves a dessert to patrons made from the same recipe. The name was given to the dessert sometime after 1893, but was not used by cook books or journals at the time. 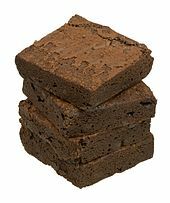 The first-known printed use of the word "brownie" to describe a dessert appeared in the 1896 version of the Boston Cooking-School Cook Book by Fannie Farmer, in reference to molasses cakes baked individually in tin molds. The earliest-known published recipes for a modern style chocolate brownie appeared in the Home Cookery (1904, Laconia, NH), Service Club Cook Book (1904, Chicago, IL), The Boston Globe (April 2, 1905 p. 34), and the 1906 edition of Farmer cookbook. These recipes produced a relatively mild and cake-like brownie. By 1907 the brownie was well established in a recognizable form, appearing in Lowney's Cook Book by Maria Willet Howard (published by Walter M. Lowney Company, Boston) as an adaptation of the Boston Cooking School recipe for a "Bangor Brownie". It added an extra egg and an additional square of chocolate, creating a richer, fudgier dessert. The name "Bangor Brownie" appears to have been derived from the town of Bangor, Maine, which an apocryphal story states was the hometown of a housewife who created the original brownie recipe. Maine food educator and columnist Mildred Brown Schrumpf was the main proponent of the theory that brownies were invented in Bangor. 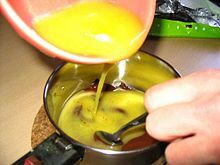 [a] While The Oxford Companion to American Food and Drink (2007) refuted Schrumpf's premise that "Bangor housewives" had created the brownie, citing the publication of a brownie recipe in a 1905 Fannie Farmer cookbook, in its second edition, The Oxford Encyclopedia of Food and Drink in America (2013) said it had discovered evidence to support Schrumpf's claim, in the form of several 1904 cookbooks that included a recipe for "Bangor Brownies". ^ Numerous works erroneously credit Schrumpf herself as the inventor. ^ a b c Gage 2010. ^ a b The Nibble. ^ Sheraton 2015, p. 1202. ^ Smith 2013, p. 220. Gage, Mary E. (February 2010). "History of Brownies (Chocolate)". Retrieved 2010-03-13. "Nothing beats a brownie". The Age. 21 June 2005. Retrieved 7 February 2016. Saekel, Karola. "Panel Gives Baking Mixes a High Score". San Francisco Chronicle. Sheraton, Mimi (2015). 1,000 Foods To Eat Before You Die: A Food Lover's Life List. Workman Publishing. ISBN 076118306X. Smith, Andrew F., ed. (2007). The Oxford Companion to American Food and Drink. Oxford University Press. ISBN 0199885761. Smith, Andrew F., ed. (2013). The Oxford Encyclopedia of Food and Drink in America. 2. OUP USA. ISBN 0199734968. "The History of Brownies". The Nibble. Lifestyle Direct. Retrieved 13 March 2013. "The Palmer House Hilton Brownie" (PDF). Palmer House Hilton Hotel. Retrieved 2017-08-05.